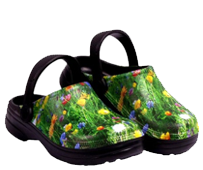 Testimonials :: Backdoorshoes...100% waterproof gardening shoes, lots of stylish designs and very comfortable to wear! "I just wanted to say how fantastic your backdoor shoes are. I bought a pair at a Christmas Fayre (Ardingly) last year and have never looked back. I have a sunflower pair and they are great from everything, to going out the back door (obviously), in the garden, driving and most of all walking my dog. Several friends (including my mum) now own a pair and our recommendations for backdoor shoes are fast going round to everyone we know and beyond!!! I'm planning to order another pair very soon so that I can have one pair for walking the dog + for in the garden & another pair to keep cleaner when I'm driving, etc. Now I have seen that you will be at the Ideal Home Exhibition later this month, that will be perfect for a purchase or two. Thank you for this invention and the best of luck with the success of your growing business." You are right - Backdoorshoes are great in the snow and ice. I've been putting mine on each time I've gone out to the bins, shed etc. They grip really well and feel very safe. Hello, My name is Eve H, I live in York. I saw your advert. in The Telegraph before Christmas and got my niece a pair of your clogs. Great success, good quality witty design and they do what they say. I have just ordered a pair for my sisters birthday. My nieces partner ( U.K. size 9) has been wearing her clogs (U.K. size 6). Not a good situation! I have just tried to order a pair of nuts and bolts in his size. You haven't got any! When are you likely to have any? In a nutshell great product. I am spreading the word. I only ordered my Backdoor shoes a couple of days ago and here they are, light, comfy (good support!) and totally-what-I-need-for-getting-out-to-the-recycle-bins-a-thousand-times-a-day-and-down-the-garden-to-feed-the-birds-etcetcetc. I am writing to say how pleased i am with my purchase of my BACKDOOR SHOES, I saw the advert in the Daily Mail before Christmas, and thought I would get myself a pair.... they came yesterday ... I wore them all day and didnt want to take them off, they were so comfortable , will be ordering another pair in the near future. Just to say a huge thank you for sending the grass shoes for my husband. As you suggested, we heated the inside of the shoe and he put his deformed arthritic foot in. It has perfectly moulded to accommodate the bump on his big toe and consequently does not cause him any pain. I am very pleased with them indeed. Finances permitting, after the post Christmas excesses, I will be purchasing both him and I a second pair each. I find them comfortable and springy. I often forget they are on my feet they are so lovely and I end up going out having forgotten to put other shoes on! They are perfect for gardening and for running up the hill to attend to the chickens. You sell a fantastic product, no wonder they seem to sell out all the time! I bought a pair at the Hampton Court Flower Show this summer and they are fantastic! They are one of my best buys ever and I plan to buy some for Christmas presents for my adult children. 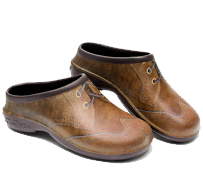 Have you thought of doing older children's backdoor shoes? I'm sure my grandchildren would find them extremely useful as they are not allowed to wear their shoes in their house and are always struggling into and out of their shoes when they go in and out of the garden at home. Once again, thanks for such an amazingly useful and comfortable item. I actually wear them in the house instead of slippers as well as for popping outdoors. I nearly didn't buy them and little thought what an essential they would become. Hi, just to say Thank you. I have my new pair of Backdoor shoes, they are great everthing that you say they are. Really pleased, sorry for being so impatient. I will tell all my friends. I would like to thank you very much for a speedy replacement to a pair of shoes I returned and the free innersoles as mentioned in previous e mail . ?I shall have no hesitation in reccomending you and your amazing shoes ! I love the shoes I bought last year and, since two bouts of foot damage, have found they are the only ones I can wear in comfort. I need more! You asked how I heard about your shoes.. My daughter in law bought me a pair at the craft show in Birmingham NEC last November/December. So I am now buying her a pair for her birthday. I have been so pleased with them going out into the garden in all weathers ,even the snow held no worries for me , no slipping over. Thank you very much. I cannot tell you how glad I was to see the promotion for your shoes in Sunday's Telegraph. I bought a pair of roses shoes at Gardeners' World Live about three years ago and they're still marvellous and since then have been wondering how to buy some more - and now I know! Thanks for sending my second pair of backdoor shoes- both my husband and I love them .great for getting out to do minor things on the farm - shutting up schickens as well as in the garden. Just a query- have you thought of doing one with bees on- I'm sure every bee keeper would love a pair along with every gardener! Thank you so much exchanging the shoes and for finding the "Bluebells". I am so delighted with them and with you for being so efficient and going the extra mile to fulfil your customers wishes. I love the shoes and wear them every day. thank you for your excellent and prompt customer service. The new pair have arrived and fit well. I think they are a great idea and will be recommending them to my friends. I brought a pair of your shoes a few years ago at The Gardeners World Show and use then all the time in the garden and when hanging out my washing & they are still going strong. I visited you again at this years Gardeners World Show and brought a pair for my husband and a second pair for my self as i could not resist your new designs. They are the best shoes i have ever brought , Love them Thanks!! Bought my last pair at the Ideal Home Show several (maybe 3) years ago and have worn them almost every day since then – they have walked literally miles (including all round London and New York. Even tho I felt a tad daft at first wandering the streets of New York in Sunflowers in the end comfort won over, and after all no-one there is ever likely to meet me again). They are now looking very tatty and I need a new pair – can you remind me please which size equates with a 6? Do I need one size smaller or one size larger than I would think, as I do recall the salesman saying one or the other. Just what I need!!. Two things though, I saw you mentioned in Garden News, not Gardeners World Magazine. Secondly. VAT is not applicable in Jersey. I shall tell my gardening friends and family about you and will be ordering when any of them has a birthday! p.s. Very good Web Site! I had my bluebell shoes for Christmas and I love them! I have used them on ice and snow and they are very safe and non slip. (They were bought at the Ideal home Exhibition). My friend visited me yesterday and spotted them at my door, so I have ordered her a pair for her birthday! Thankyou for your assistance in providing my wife’s birthday present. The choice is size 6 Sunflower. You no doubt have the address but just in case it is …….It seems that nowadays it is unusual to get such service as you clearly provide. First found out about backdoor shoes when I visited your stall at Bluewater before Christmas. I was going to buy one pair, then before I knew it I had bought six! Everyone loves them. My husband has a chilli pair (his fav food), my friend has a sunflower pair (she loves the flowers), and other friend has pink roses (anything pink) and so on.....I would recommend them to anyone. And your sales team were happy, friendly and polite too - encouraged me to buy without being pushy. Just wanted to say a huge thank you for your prompt action on being notified the original shoes I had ordered for my wife hadn't turned up. The replacement pair turned up on Christmas eve as promised much to my relief. My wife is delighted with them and ceremoniously "binned" some scruffy old shoes she used for the garden. However, imagine my surprise when opening my presents to find my son had bought me some too. So I too now sport a nice green pair of backdoorshoes. Still no sign of the original package for me wife though. Once again many thanks, brilliant service and customer care. Just wanted to say thank you for the brilliant service you provided. I ordered 2 pairs of shoes yesterday, [one a gift] and they arrived this morning. Didn't think I would get them in time to give as a present this coming Friday - absolutely wonderful. Many thanks - will be singing your praises to everyone. Just wanted to say that I first came across your shoes at the Gardening show which I visited as a birthday present in June. I absolutely love them and have just placed an order for another two pairs, as I could not manage without them. They are so comfy and easy to keep clean, I wear them all the time, around the garden and around the home. Brilliant, thank you!? ?We have one pair of your backdoorshoes and we all fight over them, daily shouting down the garden 'Who's got the shoes on?!!!' Usually the kids, to get them to the trampoline!? ?Good job Christmas is coming up, I will be back. I ordered the size 8 as you suggested and they arrived within 3 days. I was pleasantly surprised as it was the same week as New Years days. They fit absolutely fine. They do seem a bit generous over the top of my foot but this means I can wear slipper socks in the house and still get outdoor shoes on without taking the slipper socks off. They are very light in weight, much lighter than I expected. Very impressed with the product and have given the card advertising the styles to my next door neighbour because she gardens a lot and finds her clogs a bit on the heavy side. Will definitely recommend them to other people because it’s a great product. I am sure you will be very busy this year. You deserve to be. offered your superb customer service!! I just wanted to say' thank you' for the wonderful customer service I recieved. I returned a pair of shoes that were purchased at 'Gardeners World' and which proved to be too small. They were exchanged, my postage refunded and spare pair of insoles sent. I am very pleased to have my shoes standing ready and waiting each time I step into my garden. I will not hesitate to recommend your compay. Backdoor shoes were proving very comfortable; temporarily out of use as I had a minor foot operation last week and cannot wear anything other than a hospital issue sandal for a few weeks. We are pleased with them though. Our daughter who looked at us as if we were mad for buying these, has been caught wearing them and admits they are pretty good although she doesn’t want to be seen publically in them! WOMAD is next week and I would have thought they would have been a good investment. My friend’s ‘grey’ ones were apparently daisies that have faded as she wears them so much! Noticed the sandals, but how about wellies as the next project? "Excellent product backed up by exceptional customer service equals one very happy customer. Will definitely refer you to friends and colleagues. My wife and I bought pairs on the last day at Hampton Court and love them. They do everything claimed – slip on and off, don’t hang from your feet and are comfortable! 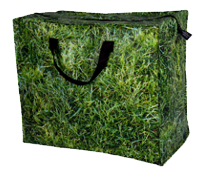 Superb for indoor use when we live in the country and are in and out of doors so frequently. Just what I have been looking for during the last many months. Congratulations on an excellent product – provided they don’t fall apart! I’m the white haired guy who spoke to the founder’s sister about silk pyjamas. Many thanks for the new pair of shoes and the postage money. The parcel arrived safely and is very much appreciated. It is so nice to find both a good product and good customer service as well. 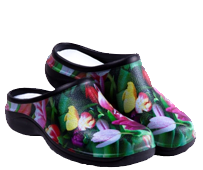 best garden shoes I have ever had !! Will you be at the South of England Show at Ardingly in June ? As a testimonial to the toughness of your Backdoor Shoes (my wife and I each have some) I ran over a pair today with the car. They suffered no damage whatsoever, and – fortunately - nobody was wearing them at the time! pair had to be exchanged for a smaller size. The shoes themselves are absolutely wonderful - the design makes me smile whenever I see them and they have kept my feet warm and dry when dashing across the lawn to feed the birds even in today's snow. The shoes are already with me and it's only 9.30. I believe that the measure of a good company is how it deals with a problem when things go wrong as they inevitably do. Your response has been exemplary. Thank you very much to all who helped. The shoes arrived this morning thank you, can’t believe how comfortable they are (do you fancy putting your expertise into making them wellies, sandals and trainers!!!!!) We wear similar garden shoes but they are not in your league. just wanted to say 'thank you' for exchanging a pair of shoes so quickly for me. Customer service 10/10!! I bought myself a pair of backdoorshoes at Westpoint last week and they are so comfortable and look great. Both my daughters would like a pair and I now know what size they need. I am sure they will be delighted with them. Items just received thankyou! Impressed with your service and have recommended the product to several friends. They fit great (could say they fit like a glove, but we all know they are a shoe, silly!) and I wouldn't be with out running about with my nuts & bolts on my feet. I purchased a pair of your backdoorshoes at the Ideal Homes Exhibition and am now ordering a further pair for myself and two of my friends want them also. Just want to say the back door shoes are great . Bought mine at Tatton Park Show and I wear them constantly . they are so light & comfy but most of all handy to just slip on at the back door .Thanking you for the ease speed and comfort. I just wanted to say thankyou so much for my pair of beautiful backdoorshoes - I wear them everywhere from driving to the stables - They are awesome! My sister in law recommended them to me and I got a pair last Christmas... just ordered another pair they are so comfortable, warm, and easy to wear... just brilliant and love the different colour. I have loved my backdoorshoes, after years of ruining slippers by popping out to the bin or to peg up washing, it is great to have them next to the door ready to slip on. Normally I like everything put away but they are really quite decorative and I'm happy for them to be out on display. As I mentioned, I'm giving my girlfriends backdoor shoes as presents - I've bought 5 pairs! And now my husband fancies a pair for when we are camping, just the thing to slip on quickly and shlepp over ot the shower block. Backdoorshoes are great in the snow and ice. I've been putting mine on each time I've gone out to the bins, shed etc. They grip really well and feel very safe.